An explanation of what we on libcom.org mean by the word "class", and related terms such as "working class" and "class struggle". The first thing to say is that there are various ways of referring to class. Often, when people talk about class, they talk in terms of cultural/sociological labels. For example, middle-class people like foreign films, working class people like football, upper-class people like top hats and so on. Another way to talk about class, however, is based on classes' economic positions. We talk about class like this because we see it as essential for understanding how capitalist society works, and consequently how we can change it. It is important to stress that our definition of class is not for classifying individuals or putting them in boxes, but in order to understand the forces which shape our world, why our bosses and politicians act the way they do, and how we can act to improve our conditions. The economic system which dominates the world at present is called capitalism. Capitalism is essentially a system based on the self-expansion of capital - commodities and money making more commodities and more money. This doesn’t happen by magic, but by human labour. For the work we do, we're paid for only a fraction of what we produce. The difference between the value we produce and the amount we're paid in wages is the "surplus value" we've produced. This is kept by our boss as profit and either reinvested to make more money or used to buy swimming pools or fur coats or whatever. In order for this to take place, a class of people must be created who don't own anything they can use to make money i.e. offices, factories, farmland or other means of production. This class must then sell their ability to work in order to purchase essential goods and services in order to survive. This class is the working class. So at one end of the spectrum is this class, with nothing to sell but their ability to work. At the other, those who do own capital to hire workers to expand their capital. Individuals in society will fall at some point between these two poles, but what is important from a political point of view is not the positions of individuals but the social relationship between classes. The working class then, or 'proletariat' as it is sometimes called, the class who is forced to work for wages, or claim benefits if we cannot find work or are too sick or elderly to work, to survive. We sell our time and energy to a boss for their benefit. Our work is the basis of this society. And it is the fact that this society relies on the work we do, while at the same time always squeezing us to maximise profit, that makes it vulnerable. When we are at work, our time and activity is not our own. We have to obey the alarm clock, the time card, the managers, the deadlines and the targets. Work takes up the majority of our lives. We may see our managers more than we see our friends and partners. Even if we enjoy parts of our job we experience it as something alien to us, over which we have very little control. This is true whether we're talking about the nuts and bolts of the actual work itself or the amount of hours, breaks, time off etc. Work being forced on us like this compels us to resist. Employers and bosses want to get the maximum amount of work from us, from the longest hours, for the least pay. We, on the other hand, want to be able to enjoy our lives: we don't want to be over-worked, and we want shorter hours and more pay. This antagonism is central to capitalism. Between these two sides is a push and pull: employers cut pay, increase hours, speed up the pace of work. But we attempt to resist: either covertly and individually by taking it easy, grabbing moments to take a break and chat to colleagues, calling in sick, leaving early. Or we can resist overtly and collectively with strikes, slow-downs, occupations etc. This is class struggle. The conflict between those of us who have to work for a wage and our employers and governments, who are often referred to as the capitalist class, or 'bourgeoisie' in Marxist jargon. By resisting the imposition of work, we say that our lives are more important than our boss's profits. This attacks the very nature of capitalism, where profit is the most important reason for doing anything, and points to the possibility of a world without classes and privately-owned means of production. We are the working class resisting our own existence. We are the working class struggling against work and class. Class struggle does not only take place in the workplace. Class conflict reveals itself in many aspects of life. For example, affordable housing is something that concerns all working class people. However, affordable for us means unprofitable for them. In a capitalist economy, it often makes more sense to build luxury apartment blocks, even while tens of thousands are homeless, than to build housing which we can afford to live in. So struggles to defend social housing, or occupying empty properties to live in are part of the class struggle. Similarly, healthcare provision can be a site of class conflict. Governments or companies attempt to reduce spending on healthcare by cutting budgets and introducing charges for services to shift the burden of costs onto the working class, whereas we want the best healthcare possible for as little cost as possible. While the economic interests of capitalists are directly opposed to those of workers, a minority of the working class will be better off than others, or have some level of power over others. When talking about history and social change it can be useful to refer to this part of the proletariat as a "middle class", despite the fact that it is not a distinct economic class, in order to understand the behaviour of different groups. Class struggle can sometimes be derailed by allowing the creation or expansion of the middle class - Margaret Thatcher encouraged home ownership by cheaply selling off social housing in the UK during the big struggles of the 1980s, knowing that workers are less likely to strike if they have a mortgage, and allowing some workers to become better off on individual levels, rather than as a collective. And in South Africa the creation of a black middle class helped derail workers' struggles when apartheid was overturned, by allowing limited social mobility and giving some black workers a stake in the system. Bosses try to find all sorts of ways to materially and psychologically divide the working class, including by salary differentials, professional status, race and by gender. It should be pointed out again that we use these class definitions in order to understand social forces at work, and not to label individuals or determine how individuals will act in given situations. Talking about class in a political sense is not about which accent you have but the basic conflict which defines capitalism – those of us who must work for a living vs. those who profit from the work that we do. By fighting for our own interests and needs against the dictates of capital and the market we lay the basis for a new type of society - a society based on the direct fulfilment of our needs: a libertarian communist society. 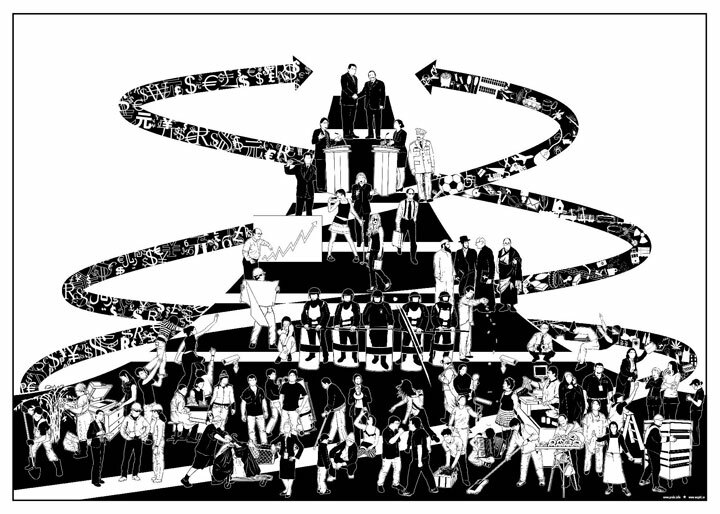 Work Community Politics War - prole.info - an excellent introductory illustrated guide to capitalism and anti-capitalism. Strata in the working class - Martin Glaberman - excellent article analysing divisions within the working class. The Working Class and Social Change - Martin Glaberman - another great article by Glaberman, this time on the meaning of class consciousness and working class action. Capitalism and communism - Gilles Dauvé - a detailed history and analysis of capitalism and its antithesis, communism, with interesting sections on the meaning of class. When we are at work, our time and activity is not our own. We have to obey the alarm clock, the time card, the managers, the deadlines and the targets. Work being forced on us like this compels us to resist. Sometimes the class struggle heats up in unexpected places – in a Times Square Diner famous for their singing wait staff, for example.